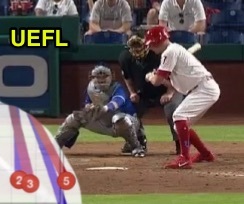 When plate umpire Joe West called Phillies batter Rhys Hoskins out on strikes with one out and two on in the bottom of the 9th inning of a one-run game, the home team grew frustrated. After the game, Hoskins explained he felt the pitch was "a little off," but concluded with a self-critique: "It's too close to take in that situation. It's unacceptable. You've got to put the ball in play and give yourself a chance." Hoskins takes pitch #5 for a called third strike. How close was the 2-2 pitch, ruled a third strike, to the outer edge of home plate, anyway? It turns out the pitch barely scraped the strike zone—and barely is putting it mildly. Oh, it was a strike and caught the plate to be sure, but by less than a single millimeter. "Too close to take" undersells just how close the pitch was. The following bit of math explains just how close the edge of Blue Jays pitcher Ryan Tepera's pitch was to the outer strike zone boundary. The px value of 0.828 was in Kulpa Rule's borderline range. The pz value of 2.065 was fully in the strike zone. Px (the horizontal coordinate) is the value we care about, and to figure out whether a ball centered 0.828 feet from the center of home plate is still partially over the plate, we begin by converting a 17-inch plate to feet: the width of home plate, in feet, is 1.417, half of which is .708 feet. Pitch tracking math tells us what happened. Since we know that px is designed to measure the center of the baseball, we know that a ball with a px value of -.708 or +.708 is centered over the edge of home plate. Official Baseball Rule 3.01, entitled The Ball, states that, "It shall...measure not less than nine nor more than 9 1/4 inches in circumference." Using significance to the thousandths decimal position, the mathematical formula for computer radius from circumference is C=2πr [r=C÷(2π)], which leads us to r=9.250÷(2π), which is r=9.250÷6.283, or r=1.472. A radius of 1.472 inches converted to feet is .123, which, added to .708, is .831 feet. 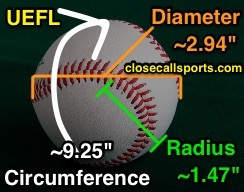 Thus, the maximum distance the center of a baseball can be from the edge of home plate for a slim portion of the ball to still pass through the strike zone is px .831, assuming a margin of error of zero. HP Umpire Joe West pulled the trigger on px .828, which provides for .003 feet, or .036 inches of overlap. That's a strike by a razor-thin margin ("any part of the ball passes through any part of the strike zone") as baseball's game-of-inches came down to less than a millimeter (.914mm to be exact).